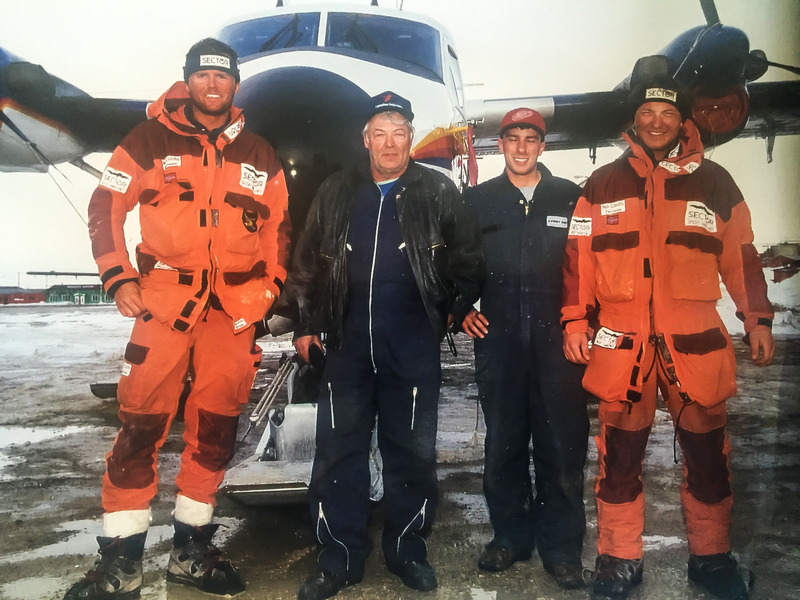 Rune Gjeldnes became interested in the idea of crossing Greenland along its long axis from south to north in 1987, only 16 years old. It was a journey that had never before been attempted and, if successful, would be the longest unsupported polar expedition ever made. A big dream and desire was born. Several years later, Gjeldnes shared his dream with a friend and navy seal colleague, Torry Larsen. Gjeldnes and Larsen used parachutes, skis, sleds, kayaks and ski-sails, as well as their climbing skills to cover the 2960 km from Cap Farewell in the south to Cap Morris Jesup in the very north. The expedition was unique, taking place in the air, at sea and on land. They were also the first known persons who parajumped on the ice-cap of Greenland, and with all their expedition gear. C-130 ready for dumping the expedition gear. One of the best view and feeling ever. Cargo drop and explorer drop. The explorers left some of their equipment at the drop-zone, just taking the necessary gear to reach Cape Farewell. They began their journey descending the spur of the glacier to sea level, and Gjeldnes and Larsen were the first people to walk up and down this “unknown” glacier. The first part of the descent was extremely steep and crevasses were a constant danger particularly in the last 8 km. In the bottom of the glacier they had to climb down a 150 m high rock-face to reach the water. One of the camp spot´s in the fjord system South Greenland. The goal for this part was to reach Cape Farewell by kayak, but they met lot of trouble on their way. March 26 they turned over with their kayak in a sudden wind and big waves. They got heavy problem to get into the kayak again, and were laying in the water for 12-15 minutes (Water temp: 0 degrees Celsius. Without drysuit). It took them 45 minutes to reach land, were they dried the clothing and heat them self in the sleeping bag. They continued, but one day from Cape Farewell they had to return, because the fjords were blocked of heavy drifting ocean-ice. Torry ready for a new day in the Klepper. 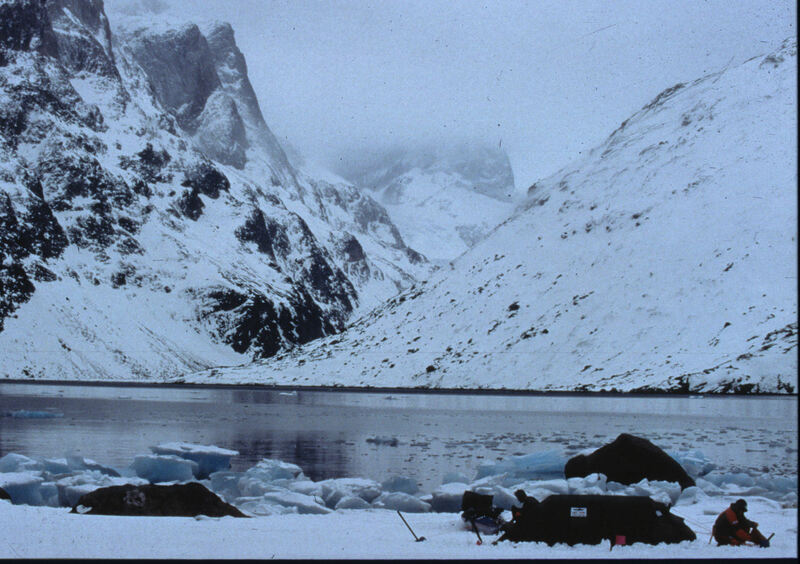 Emergency camp after capzising with the kayak mid fjord. The ice flow starting to close one of the fjords. Heading north to the base of the glacier, they got 4 days in lay-up position because of heavy wind, up to 60 knots. They were heavily indented by deep fjords and coastal mountains dropping sheer to the sea, this stretch of coast is extremely difficult to land on. The steep terrain, strong currents, climatic conditions and ice drifting in the fjords pose serious obstacles. Blizzard and out checking the sled and tent. At the base of the glacier they started the climb up to the drop-zone at the glacier, a trip presenting the same difficulties as the outward journey. This required suitable climbing equipment, which they had. Gjeldnes and Larsen were reorganising and preparing the sledges at the drop-zone for the long climb up to the high central plateau of 2500 meters at latitude 62 N.
Heading north for the plateau, but they got more problems than expected. The terrain went up and down hills for 130 kilometres. Lot of mountains were not marked on their map and with sleds on 175 kilos, they had a hard period. And in addition to this they also got very bad weather. One period they were in lay up position for five days, because of heavy wind and snowing, with a wind-speed up to 25 m/s (50 kn.). Their good mud were their rescue. Skisailing into the sunset. Western Greenland. The high central plateau (62 N to 82 N), known as Inlandice, is an immense, wind-blasted landscape extending monotonously for thousands of miles. 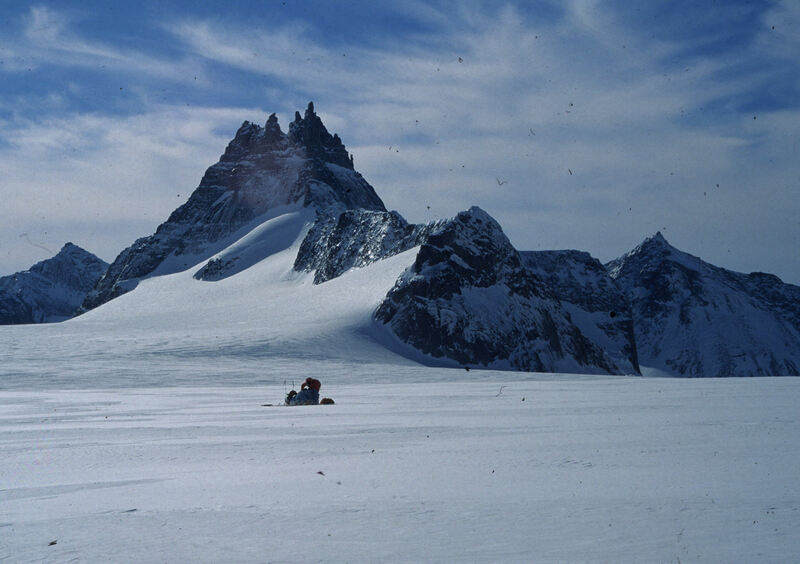 Compared to a frozen wasteland, the desolate plateau has an average altitude of over 6,600 ft. (2000m) above sea level. Some places the ice-cape can be over 9000ft. (3000m) thick/deep. The G2 members moved for the most at altitude of 2500 m, but they also were as high as 9500 ft/2900 m. In this period each day was almost equal, because of the monotonously landscape. Everything became routines. Their problem, without reason, were the uncertainties about; how many days left, next days weather conditions, would they reach the northern part before the snow started melting etc. This psychological condition was strange, and to understand, you have to go through it. After months of isolation, they slowly, but inevitably go through a mental change. For example, the outside world became less important in one way. First of June they could see the mountains in the very north of Greenland, also called Peary Land. This moment was one of the greatest moment for Rune and Torry during the expedition. After months with just a white horizon to look at, the view of mountains was amazing, and they also new that the goal was not fare away, just 300 km. The decent of the Henson glacier gave Gjeldnes and Larsen some problem. In the bottom of the glacier they had to use rope to rappel down a 85 metres high ice-wall, with all their equipment and themselves. From this place they were trekking north through ice covered fjords which were encircled with mountains, before they met the Arctic Ocean. The last 60 kilometres they walked eastwards. 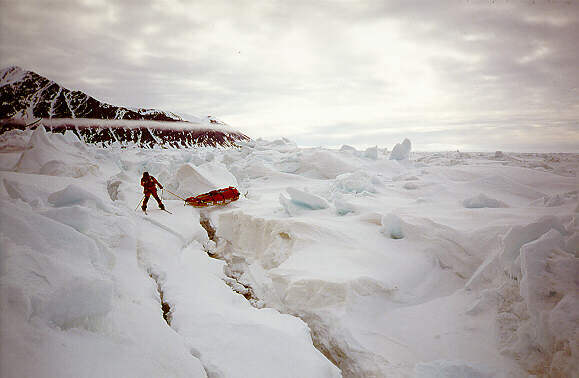 In this area there are lot of pack-ice, the same obstacles as North Pole explorers have. Here you also have lot of Polarbears, but the explorers didn’t see any of them, just lot of tracks. Trying to find the way down and off the glacier. 80 meters abseiling down to the rocky ground. 12.45 PM Gjeldnes and Larsen reached their goal, Cap Morris Jesup, after 86 days and 2928 kilometres trekking, and NO quarrelling. This is the northernmost continental point. Next stop now would have been the North Pole. The nearest village and airport are 1,000 kilometres away. But 2 days later a Twin Otter and their “No Limits Sector support team” picked them up and back to civilisation, to Canada. Crossing the Sirius Pass. Just in time before the snow was totally gone. southernmost position, back to the drop zone and onwards to Kap Morris Jesup. It is computed as geodetic distances between the way-points (the geodetic distance between two points is by definition the shortest one; it is not entirely coinciding with the straight line between the points). on the WGS84 ellipsoid. Topographic information on the bedrock part is not included in the computation as the precise route is not known and as the height information outside the ice sheet is not always sufficiently reliable. On the ice sheet, a simple geometrical argument shows that even though the journey is distance only, even for rather steep slopes on the marginal ice sheet. These factors are not taken into account in this computation. On this background, I have not found it fair to determine the accumulated distances with more than 1 km accuracy. 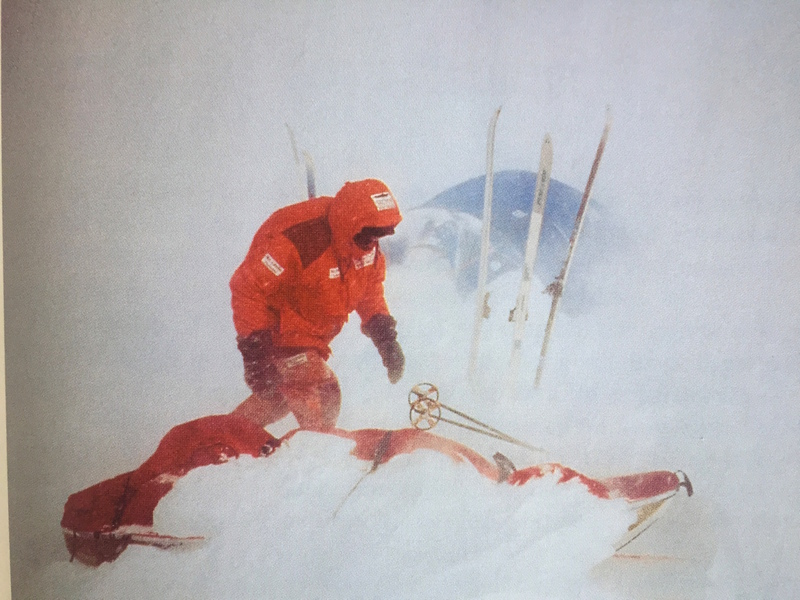 The old world record of 2,172 kilometres were set by the two Englishmen Randhulf Finnes and Mark Shroud in their attempt to cross the Antarctic in 1993. Picked up and back in Resolute Bay. With the legendary pilot Carl, First Air. 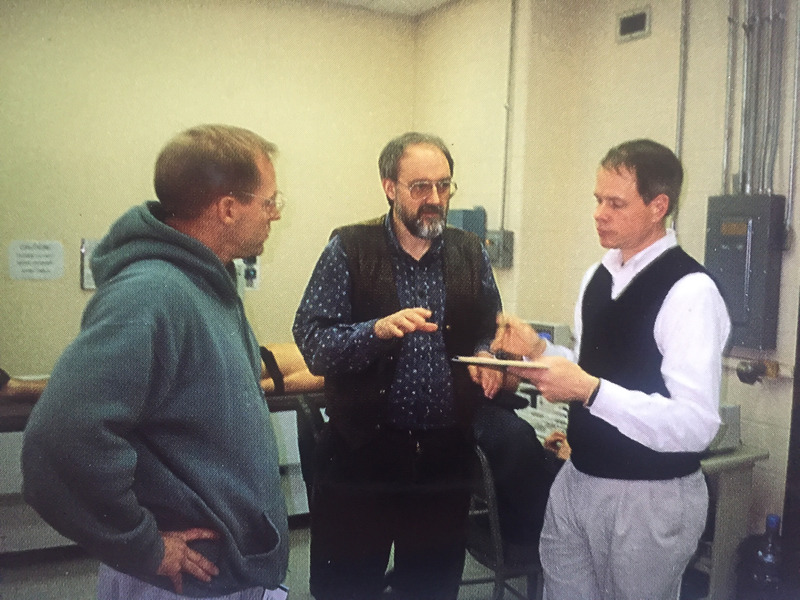 The G2 Expedition, provides a unique opportunity to define currently unknown consequences of a world record sustained physical effort to physical performance capabilities. They agreed to be studied by a medical research team from the U.S. Army Research Institute of Environmental Medicine and the Norwegian Defence Research Establishment. 3. 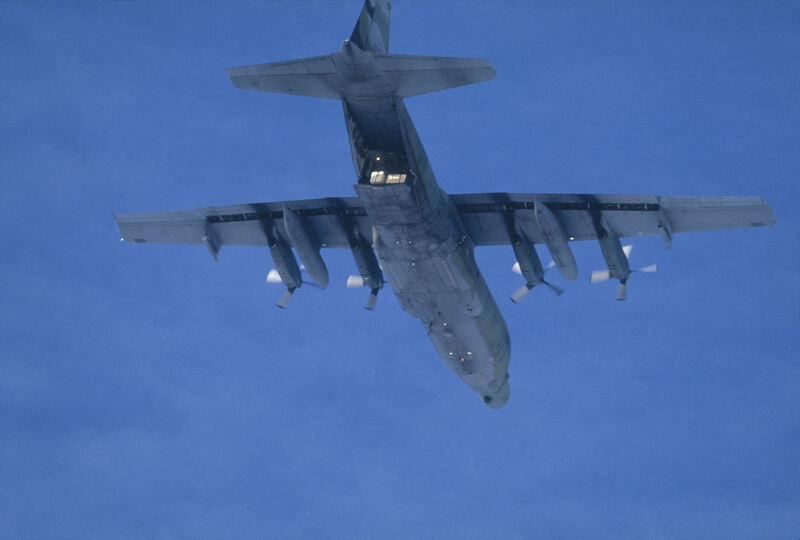 Adequacy of 6.000 kcal/d to maintain body weight and performance in extended ground operations in the cold. 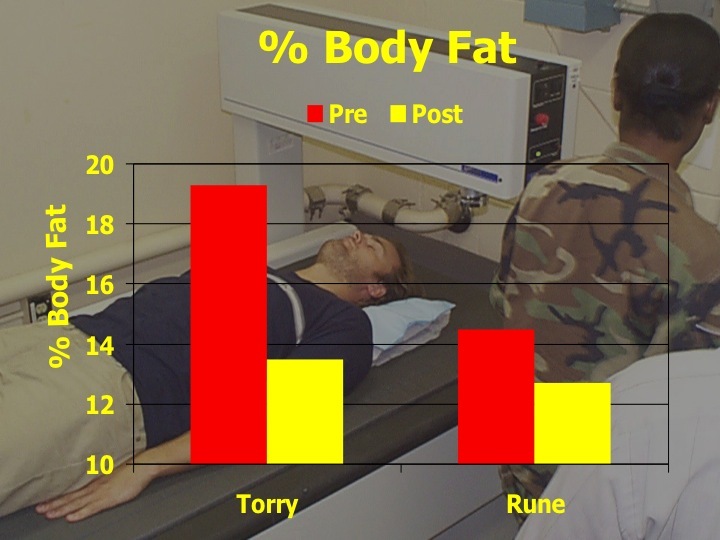 Baseline measurements included detailed analyses of the body composition by dual- energy x- ray absorptiometry, magnetic resonance imaging, and physical performance tests including power and speed strength. During the expedition, the two men dosed themselves at 3 time points with doubly-labelled water / heavy water and collected biological samples which allow precise calculation of energy expenditure rates. All the baseline tests were repeated few days after the end of the expedition. Today there are no results to publish from the research project, but it will come. General the results before start of the expedition indicated that Rune and Torry had a very high strength and work capacities, exceeding the average fit male. • Electronically-timed obstacle course (with and without 34 kg rucksack loads); Rune broke the without-load course record and Torry broke the with-load course record. Cart pull (70 kg) was measured for and indoor 2 mile course; Rune completed this in 13:00 min, and Torry in 13:22 min.